Even in winter, Portland, Maine, bustles with tourists and residents enjoying the city’s artsy shops and eclectic restaurants. But on Saturday, January 26th, the streets of Portland were full for a different reason. 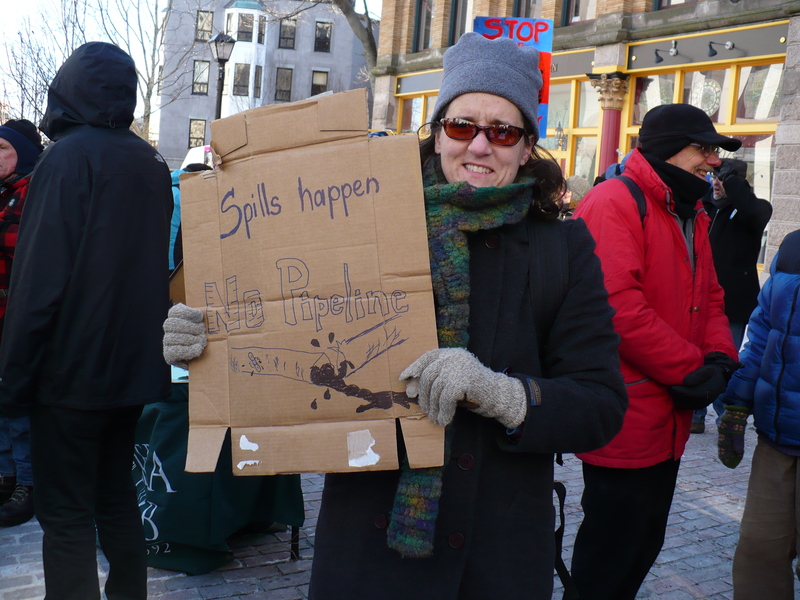 Between 1400 and 1500 people, myself included, marched through downtown to the Maine State Pier to protest a pipeline that would bring tar sands from Canada through New England. The pipeline already exists and currently carries conventional crude oil from Portland to Montreal. According to the Natural Resource Council of Maine, the Sierra Club of Maine, and EcoWatch, plans are in the works to reverse the flow, sending unrefined tar sands (aka, oil sands and diluted bitumen) from Canada through Vermont, New Hampshire, and Maine for export. Media coverage of the proposed Keystone XL Pipeline has raised awareness about the dangers of tar sands, so the environmental risks are familiar to many. The Natural Resources Defense Council has reported that tar sands are highly corrosive and that existing tar sands pipelines are extremely prone to leaks. The process of extracting tar sands is destructive and creates huge amounts of toxic waste. A recent study indicates that carcinogens have increased in lakes near the sites of tar sands extraction. Perhaps most significantly, use of oil from tar sands perpetuates dependence on fossil fuels that release carbon into the atmosphere, worsening global warming. But those of us marching, chanting, and carrying signs and banners were not in Portland just to raise awareness of the dangers of tar sands. We were there to shine a spotlight on plans that have, until now, gone largely unnoticed. The companies operating the existing pipeline seem to have local roots, but they are backed by the power players of the fossil fuel industry. ExxonMobil has major interests in Portland Pipe Line Corp., which operates the stretch of pipeline in the United States, and Montreal Pipe Line Limited, which owns the Canadian stretch. Enbridge Incorporated in Canada owns other pipelines that would connect Canadian tars sands from the west to the northeast pipeline. 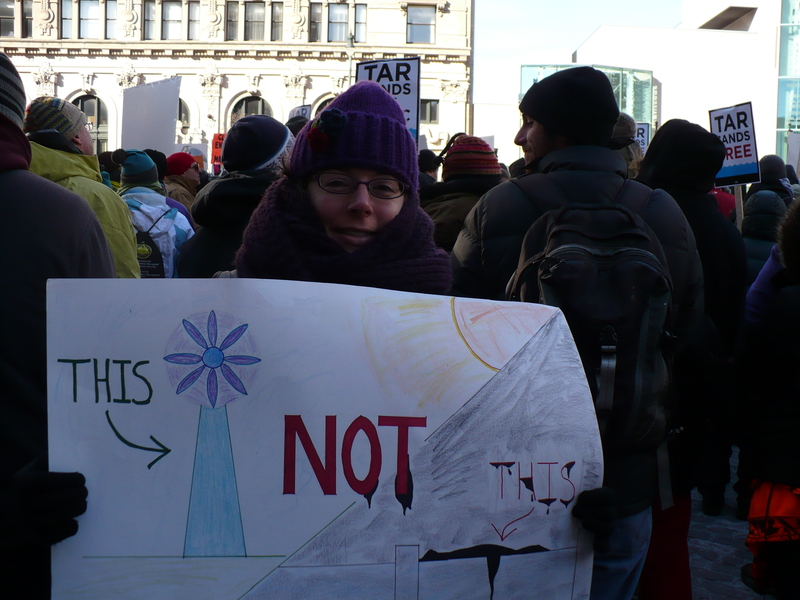 And although the companies associated with the pipelines claim that they have no plans to reverse the Portland-Montreal pipeline, actions such as Enbridge’s application for a permit to reverse the flow of a pipeline in Ontario (so that it would flow west to east) undermine the denials. At this point, it’s impossible to know whether the protest has had any impact on plans for pipeline reversal. But the marchers and speakers from across Maine and New England can rest assured that we succeeded in bringing attention to the issue. The protest was covered by the Associated Press, and the story ran on the sites of national news outlets, including the Huffington Post and San Francisco Chronicle. And as for the passersby who happened to be out and about enjoying Portland’s amenities? They smiled and took photos. The windows of one downtown hotel were lined with people waving and cheering us on. The fight against the fossil fuel companies has only begun. The major corporations that have vested interests in coal, oil, and natural gas will make every argument and spend every dollar required to prevent a transition to renewable, sustainable energy. But if the United States’ proud tradition of activism has taught us anything, it’s that if enough of us march, chant, and carry signs, we can meet the challenge. 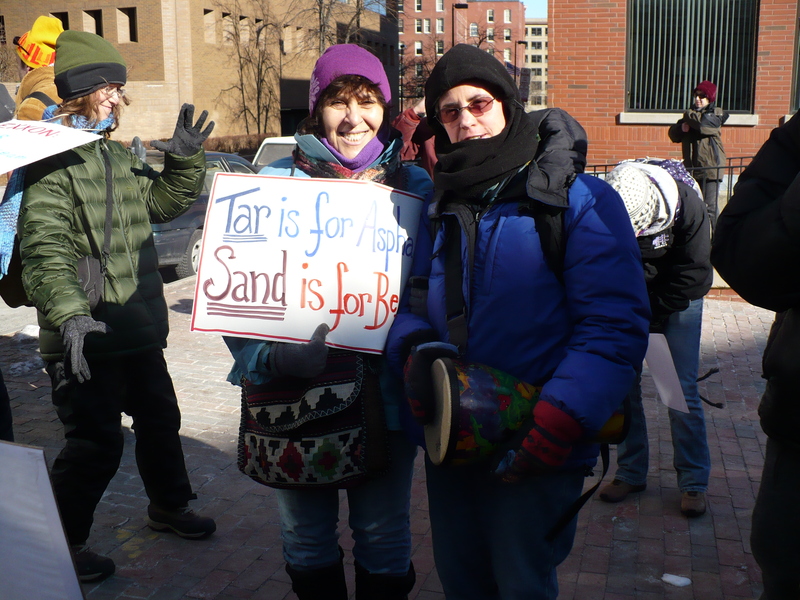 If you would like to learn more about the proposed pipeline reversal or get involved in making sure that tar sands stay out of New England, visit the website of Tar Sands Free Northeast or 350 Massachusetts. If you are ready to take action to oppose the Keystone XL Pipeline, consider being part of Forward on Climate, potentially the largest climate change rally in history, in Washington, DC, on Sunday, February 17th. You can get more information at http://350ma.org/ or at http://act.350.org/signup/presidentsday.